The director of the Smokey and the Bandit franchise once again makes a film out of racing and Burt Reynolds, and with The Cannonball Run there are countless other stars to beef up the cast. The expansive cast and return to a winning formula isn’t quite enough to make The Cannonball Run a classic, especially since the storyline seems to be lacking some, but it is a decent night’s entertainment. A little bit of humor, a little bit of action and a lot of stars make for a fun 95 minutes, vapid as they may be. Once again illegal driving is at the top of the storyline for director Hal Needham, though this time the plot is based on a real-life race known as The Cannonball Sea-To-Shining-Sea Memorial Trophy Dash. This highly illegal race pits drivers in an all-out cross-country dash. There are no rules and anything goes, leading to a number of on and off-road hijinks between the racers. The all-star line-up of racers are played by countless memorable faces, including Reynolds, Roger Moore, Dom DeLuise, Dean Martin and Sammy Davis Jr., not to mention Farrah Fawcett. If two members of the Rat Pack aren’t enough, I’m not sure what is. 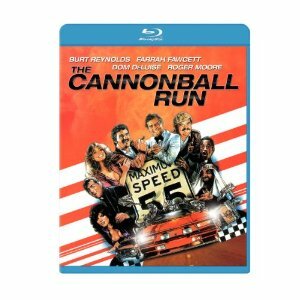 The Cannonball Run is available on Blu-ray for the first time, providing a high definition presentation of all the car crashes and action mishaps along the race. The special features include a commentary track with Needham and producer Albert S. Ruddy.